Thank you for letting me know the thoughts on your end. I think the final reason you banned me was because I was challenging the Munich Re graph used as proof that weather events were getting worse because of AGW. I am not sure why the data I was posting was off topic for that particular thread. You are a good moderator and have been quite helpful to me on an individual basis (as you described in your post). I thank you for this. You do believe I have an agenda (perhaps to misdirect). My goal is to keep thought and thinking alive. When I see some thread posted on Skeptical Science with no challenge of the premise I will take a stab at it. My thought process may not be the cleanest and may annoy disciplined thinkers like yourself, but the goal is always to keep thinking going. Questioning and challenging ideas and topics. Especially ones that assume weather events are getting worse without a really and detailed study of past events. Also moderators, sorry if this post is off topic. If it goes into the borehole Daniel Bailey may never see it. I’m not sure just how good that study is, but it was interesting that it seems to be the better educated conservatives who are moving away from science there. Conservatives have long attacked liberal education while benefiting from it: http://en.wikipedia.org/wiki/The_Closing_of_the_American_Mind#Summary but that seems to have become a habit and spilled over to hard sciences which they used to support. What is extreme, and what constitutes a drought, would be the driest YEAR on record (2011). When the water source (a reservoir, Lake Travis) for hundreds of thousands of people is 60% full at a time of year when it is usually 100% full, as it is now, is extreme. Despite our relatively wet (but not record-breaking wet) spring this year, our aquifers are so depleted from a record year of drought and are soaking up so much of the rain that lake levels have been very slow to rise. If this doesn’t improve, we are in BIG trouble. That’s extreme. What’s extreme for central Texas is a wildfire that burns over 50 square miles of forest, and over 1,200 homes (Bastrop, Texas, 2011). How about the record number of days above 100ºF? Having experienced it, I would call that extreme, and I would also have to call that the summer of 2011. Meanwhile, our lovely Governor continues to call the science behind anthropogenic global climate change “all one contrived phony mess that is falling apart under its own weight.” I would call that statement extreme, and extremely false. And elsewhere – how about little appreciable ice cover on most of Lake Erie this last winter, for the first time ever? How about leaves emerging in the spring in northeastern Ohio consistently ONE MONTH earlier than they did in the 1960’s? Are these events extreme? This short article is what I am talking about. Texas did have a bad drought in 2011. Does that mean it was caused because of AGW? Possible but one should study the issue before forming an absolute position on the topic. Evidence exists of megadrought in your area in the past and large floods on the Mississippi. 100 years of data may not be nearly long enough to form conclusions that AGW is making droughts worse. Texas has had some bad droughts in recent times. 2011 was the worst but others were also very bad for the people living in that area. It seems Texas is prone to droughts every few decades. And the modus operandi continues, unabated. Norman, if you think we need 100 years of data of the destruction of people, their homes, and their livelihoods, leaving a 100% informed but inhospitable planet no longer inhabited by most of the descendants of maximizing anti-regulatory pro-consumption dreamers and the rest of us, you’re not paying attention. This is not a laboratory or a political contest but an attempt to share what we already know about the complexity of reality home to people who can do something to improve our odds. Sorry about the gluey sentence, happens when one gets worried and sees someone pretending reality can be bent to their purpose. This is not new – it became blindingly clear to those paying attention in the 1980s. It’s just playing out with every detail and development occupying the higher end of the error bars as they get smaller with more of your “data” and more unintended consequences of our manipulative ways emerge. The only hope I see with you and your ilk clogging the conversation is that people who don’t follow science are worried sick and may – in the teaparty phrase – say they’re sick of it and won’t take it any more. Daniel Bailey has made the effort to provide a detailed summary of the massive kidnapping of conversations by Norman, despite extended tolerance of his detailed and skilled hijacking work. His description perfectly matches what we see here, overwhelming verbiage intended to prevent the rest of you from being productive and mislead casual visitors. Bore hole, please? Chris Mooney is a favorite of mine and I’ve followed the evolution of distractionalism since the mid-oughts, but my comments were from my own observation (I was a child during the “egghead” phase). The Bloom article is interesting, but my generation got a lot of philosophy from pop music. Unfortunately some of the more creative forms seem to have been kidnapped by melismo and rage rhythms. I’m not sure the classics weren’t overdue for replacement and a lot of our troubles stem from the ideas of entitlement and exploitation inherited from the British Empire that bequeathed them to us. It is distressing to see the increasingly professional level of anti-knowledge promotion. Imitation may be the sincerest form of flattery, but it is heartbreaking that the truth no longer shines so clearly in comparison. Money talks, and it is advantaging itself in this conversation with the best PR it can buy. To continue in cliche, it is easier to destroy than to build, and the original may be difficult to distinguish from the copies, while the copies are more professionally distributed and promoted. No, that short article has NOTHING to do with your absurd — and patently dishonest — claims. You are just hand-waving at it. Dear moderators, it seems that we already have one “pet troll” around here, whose blatantly obvious efforts to waste people’s time with repetitive BS are tolerated for reasons that elude me — that being Dan H.
One is more than enough. Can Norman’s nonsense please be directed to the Bore Hole where it belongs? 1. Why are you afraid of posting your real name? 2. With incased heat energy and water vapor in our global climate system due to increased radiative forcing, which is due to increased GHG production form human sources; please hypothesis, do you ‘think’ the dice would load toward more intense weather events (drought, flood, snow, rain, cyclonic activity) based on these facts, or would it become less intense? I do not have access to a copy of the paper currently being discussed but I did read the earlier PNAS paper by the these authors on the Moscow heat wave. Although I have some disageements with their approach in that paper of restricting their retrospective consideration of the probabilities of such events to a single decade ( sort of like examining a jackpot win on a slot machine to a single day and ignoring the fact that no jackpot had been won in a long time previous to that), what I found particularly strange was the method for actually calculating the specific probabilities which formed the main results of the paper. Next we apply the analysis to the mean July temperatures at Moscow weather station (Fig. 1E), for which the linear trend over the past 100 y is 1.8 °C and the interannual variability is 1.7 °C. Their ratio of 0.011∕y yields an expected 0.29 heat records in the last decade, compared to 0.105 in a stationary climate, giving a 64% probability [(0.29 − 0.105)∕0.29] that a heat record is because of the warming trend. 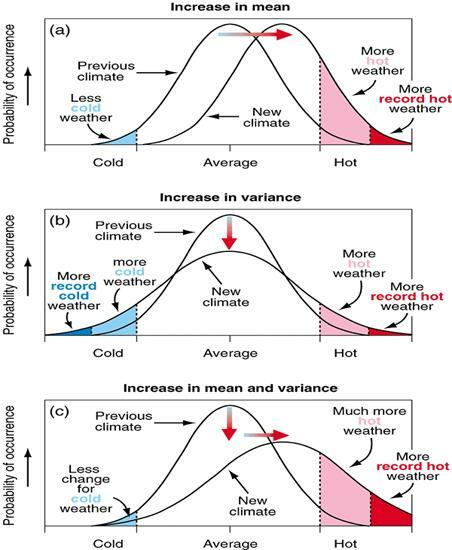 If instead we use the more realistic nonlinear warming trend as shown in Fig. 1E, the expected record number is 0.85, which implies an 88% probability [(0.85 − 0.105)∕0.85] that a heat record in the last decade is due to the observed warming trend. What I don’t understand is why the calculated values (.64 and .88) can in any way be interpreted as genuine probabilities. 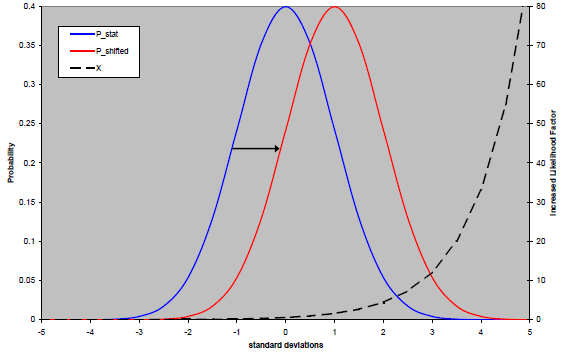 If the method is correct, then in the case where the two expected values were the same, the resulting probability would be zero and this “probability” would presumably apply to whichever scenario had been chosen as the base for the comparison. Perhaps the authors could provide a reference which would detail the assumptions for and a scientific derivation of this method. Since you have inferred that local is global, do you know why it’s colder in Antarctica than the Sahara desert? And I agree, any irrelevant answers from Norman should go to the Bore hole. Please site evidence of my absurd or patently dishonest claims. And also while your at it, explain why the article I linked for Craig Nazor is “hand-waving”? What are my claims exactly that you believe are dishonest? The link I provided to Craig Nazor answers the question he asked me. He sited the nature of the 2011 drought in Texas and I demonstrated that megadroughts have taken place in that area in the past. How is this dishonest? What part of my posts are not based upon science? You may consider my posts trolling, I consider them questioning what has not been proven. Did you read the link I sent? It is difficult to determine the direction of the frequency and intentsity of cycles because of lack of hard evidence. Ongoing research is taking place to try and fill in the missing data with creative proxies. Let the data determine the situation. Questioning a position should be allowed. The moderators on this site are climate scientists, maybe they will allow the questions as long as they are backed up. So far I have been backing up anything I suggest with available evidence. What evidence that I present are you so against? My last name is not that important. I am not a famous person. I live in a small town close to Omaha Nebraska. Grinvalds is the last name if you think it has value. I have a BA in Chemistry for Midland College in Fremont, Nebraska. To answer one of your questions, cyclonic activity (extratropical anyway). Here is an article of interest. If you do not want to click the link. If you take an honest look at historical weather events, it is far from certain you could conclude that events are getting more extreme. This suggests that you consider your personal observations to somehow trump the extensive compiled work of many professional researchers. That is whereupon I based my guess that you are not a researcher, at least according to the standards you suggested. If you disagree, perhaps you could elucidate me on how to view “looking at all the data” in light of your cursory reference to the SREX report and your casual review of a few very local data. John, Norman *did* post their name. It’s “Norman” and this handle has a known identity and reputation. They may go by Norman Grinvalds in other parts of life, or at least that’s how they signed their purported email, but so what? The total lack of any scientific sense is much more relevant to our discussion. My reason for responding is to note there is in fact an interesting philosophical discussion about whether God plays dice, as Einstein put it. The question has as much practical importance as worrying about whether real numbers are physically realized. Namely, almost none. Cryptographers would like to have some true randomness because some theorems need it. But even there, bounded computation comes to the rescue: if it would take more computing power than you’ve got to distinguish something from random, the best you can do is make random predictions. A chaotic system is defined as one in which if you have any error in the initial measurement, then after some time (which is a function of the initial error), you have no ability to predict where the system will be. So it’s indistinguishable from random. On the flip side, if you have good initial measurements and a good model of how the system evolves, you can predict the system for a little while. This claim that stochastic means iid has no redeeming qualities however. It’s my personal pet peeve. If Norman wants to make ridiculous out of context claims, or anyone else for that matter, I think it would at least show integrity if they/he had enough honor to stand by their/his words by using ones full legal name. I beg to disagree. Mr. Norman might be a man of the most perfect integrity, who chooses to omit his “full legal name” for reasons of privacy. Mr. Norman might be the nom de plume of a battered spouse, for example. You may argue that Mr. Norman is misled, or worse, that his comments are ingenuous attempts to mislead, but the fact that he does not post his name is no reason, a priori, to weight his words one way or another. You may observe that i do not post with my “full legal name” either, (which is easily found), but i do hope that you will not hold that against my arguments. Our hosts here at realclimate do not require full names but you seem to be more discriminating. I certainly do not disagree with legitimate reasons to post anonymously. I am glad that Norman Grinvalds is willing to at least stand by his words. And you can beg all you want in disagreement, but I doubt anyone has perfect integrity. Plus, i’ve heard the spouse abuse argument before. You extrapolate too much in support of your point. As I have indicated, those that have no such dangerous impediments should use their full names to at least stand by their words without being a figment of voice. And I have no issue with fair argument when it is based in pragmatism and relevant context. Norman Grinvalds has no such basis in the gist of his position. He has demonstrated in his visit to this thread that he uses facts out of context as the basis for his arguments. It may be possible that he will learn the context someday, but thus far that seems to be a point in the future. Learning requires an open mind to well founded reason. Normans grasping at out of context straws indicates that he does not have the perspective required to comprehend the science nor the implications derived form that science, even though it is essentially cause and effect when you boil it down. 1. From my perspective it does not matter if you are famous. I merely consider it important that people take responsibility for their words, especially, when they seem so far departed from reality, as it indicates at least the integrity to do so. I wish more would do so. 2. As to the PDF you linked to. I did take a look and as expected you are taking the information out of context. The paragraph you chose focuses on the text that you apparently believe supports your general perspective. But you ignored the paragraphs before and after, and the fact that the paper itself is a particularly focused study attempting to identify some interesting information. which appear before and after the paragraph yo chose to quote. Your cherry picking of course. The general consensus seems to be that that there will be fewer storms but larger and more intense storms when they do spin up. This is indicated in multiple studies and still seems to be the view that is holding up in the science literature. So effectively, your position is untenable based on the evidence weighed in proper context. I do hope that you begin to look at the globe rather than regions and and improperly considered time scales and seek deeper into the relevant context of the studies you are cherry picking from. You will learn more when you are looking at the strongest material, that which has strong support in the peer reviewed literature or has survived peer review, but only when examined in relevant context. You too will eventually assimilate what this means I imagine, it is only a matter of time. You did not address my point. The article you posted is irrelevant to the point I am making. The fact that a “megadrought” may or may not have happened hundreds or thousands or millions of years ago is irrelevant, unless you are willing to take into account the best scientific explanations for that megadrought and compare them to the best scientific explanations for what is going on now. Extreme weather events are becoming more frequent, and they are favoring warmer and dryer, but that’s not all. Twenty years ago, white-winged doves weren’t found in Austin, only farther to the south in warmer climate. Now they are the most common dove species, and they are displacing the formerly abundant mourning dove, because average temperatures are rising. Observations such as this are happening all over the planet. We have a very good scientific idea as to why all of these events are happening now (both more extreme events and an overall warming trend in averages), and some of us want to see action taken now to avoid a lot of human suffering , as well as to avoid serious destruction to human civilization. So I ask you again, what exactly is your point? It isn’t quite clear. Maybe this question will help: do you believe that anthropogenic global climate change is real and is happening now? Oh dear. Just a reminder, trolls are not exemplars of peak mental health. Before responding it might be a good idea to ask yourself if what you’re going to say will just enable the crazy and clog the thread. Sometimes, if you can’t help yourself, it’s better not to respond directly but to put your points to saner members. Also, I know you’re supposed to disarm trolls by complimenting them, but telling them how good they are at what they do is probably counterproductive. No doubt Dan H. already fondly thinks of himself as The Dean of RC Contrarians. “Dear moderators, it seems that we already have one “pet troll” around here, whose blatantly obvious efforts to waste people’s time with repetitive BS are tolerated for reasons that elude me — that being Dan H.
Intriguing. If we can only have one, perhaps a troll fight to the death. My money’s on Normie. I think he’d thrash the bejeebers out of Dan H. and leave him cowering under his moss covered little toll bridge. Camburn at Skeptical Science here did provide a long term global view of extreme weather events in this document. A thousand year period of extreme floods and then a 2000 year period of only minor floods. Another reason to study paleoclimatic extremes is to try to ascertain what sort of behavior is possible. There is no guarantee that local climatic events from 5-6000 years ago are in any way representative of what we can expect from the current climate or indeed from what the current climate would have been absent anthropogenic warming. In this sense, a 1000-year period of extreme flooding in what is currently the US breadbasket is certainly an admonition that we could realize similar conditions with our current experiments with climatic alteration via greenhouse gas injection. Such an epoch would undoubtedly be a serious concern if we are to feed a world of 10+ billion people by mid-century. Were paleoclimate the only thing we had to go on, this prospect would remain an admonition. However, the physics also suggests increased extreme weather, so the prospect is elevated to the level of credible threat. In addition to Rays pertinent comment #124 – In this case it’s all about attribution. The key is what is the cause factor in different cases. As I have said in the past, the reason one person gets mad at you may not be, and in fact is likely not, the same reason another person gets mad at you years later. But to be sure, you still need to determine the reasons and cause factors. That is what climate science does in attribution analysis. hey guys, back to the science please. Tune out the trolls – you give them attention, like a two-year-old, they will amplify. Time them out – they can’t stand the silence. Yes to your question. I do think the addition of CO2 via burning fossil fuels does cause some warming. The point is to determine if extreme weather really is increasing do to the warming or not by comparing past extreme weather events that took place without the warming to then make determinations on course of action. It is a matter of concren and degree. If things will get very extreme soon the human race may have to take some drastic action to curb CO2 emission. If not so extreme, the human race can gradually wean itself off of fossil fuels as other technology becomes available. You are perhaps convinced of the worst case model prediction and want drastic action at this time (even though no alternative source of energy is available to sustain the current living standards). I am not so convinced at this time. Basically the extreme weather of the future is the result of model runs. It is variable and usually they take a large number of models to try and get a best look at potential future climate. If this task would be taken on by the those who program climate models it certainly would help settle the issue. The task would be for climate models to predict major climate events accurately for the next 10 years. Where the next major global droughts will occur, how long they will last and how much area they will cover. The same with very wet areas and which major rivers will flood. Prediction of major heat waves and cold snaps. It the models could provide this predictive power I would then suggest that more drastic curbs of CO2 might be in order. In the meantime I would think what Obama is doing is a good step. Make cars more fuel efficient. I am slowly making it through Chapter 3 of the IPCC SREX report on extreme weather. I have not found the information I was looking for at this time but maybe you are familiar and can supply good links (if interested). My claim is that exterme weather patterns (drought, heat wave, cold snap, or flooding) are created by known phenomena and are not random fluctuations of the temperature field. The phenomena that generates these extremes is atmospheric blocking patterns. All the recent heat waves have been attributed to these blocking patterns. I asked the question on Skeptical Science and will ask it here. If AGW will increase the number and length of blocking patterns then I will completely agree that global warming will lead to more extreme weather. I have not found a study to detrmine this and I am not even sure why they form and why they persist. Well known blocking patterns and the weather they create. Evidence that both Europe of 2003 and Russia of 2010 were the result of these persistent blocking patterns. Hot in one location then on the opposite side you see much cooler (below normal temps). Just as described in the site explaining the common blocking patterns. My question to either of you is what evidence do you have to prove that blocking patterns will increase in the future leading to more extreme heat waves, droughts, and floods? (Also possilbe cold, Fairbanks Alaska had five days in a row of record cold temperatures in November 2011). But, that only seems to work if there is a policy issue. Teaching astronomy, I’ve run into issues where students are upset about a 4.6 billion year age of the solar system or 13.7 billion year age of the universe. No policy issue there. And, while we can read quite a bit of racism into opposition to evolution, there are no specific policy issues affecting oil companies or their ilk attached to that. So, I suspect that the opposition to science comes first, and then it is exploited when there happens to be a policy issue that touches the anti-science posture. And example aside from climate change might be exploitation of opposition to stem cell research in order to get more traction in attempting to control women’s reproductive rights. It may seem kind of chicken and egg, but, I think the opposition to science comes first and then it is exploited when there is a policy issue through dishonest dealers such as the Heartland Institute: Don’t like people in lab coats? Don’t let them tell you smoking is dangerous. What do they know…. Chris Mooney and Andy Revkin both seem to think that the conservative distrust of science comes from policy disagreements first. In the case of Andy, I’d say that his proven distrust of science is based on policy disagreements first. Though he’s very coy about it. We only have to look at his dismissal of this post (the OP) for evidence, and it’s not the only evidence, by far. Revkin has made clear, though not intentionaly, that the science scares him, seeking him to seek “balance” by embracing RPJr and being relatively dismissive of mainstream scientists such as those who run Real Climate. You still have not addressed my point. Trying to understand a change in the temperature (energy) of the climate system without understanding the state of the climate system at the time of the temperature measurement and without understanding the cause(s) of the temperature change is not likely to reveal much useful information about the way the climate system will respond in the future. Do you believe that anthropogenic global climate change is real and is happening now? Likewise, a discussion of extreme climate events without understanding the state of the climate system at the time of those events and without an understanding the cause(s) of those extreme events is not likely to reveal much information about the magnitude of climate events in the future. I see we are back to tail chasing. At least it’s a new tail. “The UN’s former climate chief on Tuesday said the global warming pledge he helped set at the Copenhagen Summit little more than two years ago was already unattainable. “I think two degrees is out of reach,” Yvo de Boer, former executive secretary of the UN’s Framework Convention on Climate Change (UNFCCC), said on the sidelines of a conference here on June’s Rio+20 summit. The UNFCCC’s 195 parties have pledged to limit the rise in global average temperatures to two degrees Celsius (3.6 degrees Fahrenheit). The target was set by a core group of countries in the final stormy hours at the Copenhagen Summit in December 2009 and became enshrined by the forum at Cancun, Mexico a year later. “Do you believe that anthropogenic global climate change is real and is happening now? I did answer your question with a yes in post @128. I also address you point about extreme climate events in my post @129 where the topic is blocking patterns and their known effect on extreme weather conditions. So far I have not seen the topic of blocking patterns discussed in the IPCC SREX report. Primarily the studies use computer models for both analysis and reanalysis. These models may be spot on. But to verify their ability to accurately predict the future they should be tested so I still stand by the challenge in post @128. If the models can accurately determine extreme climate events in the near future (floods, droughts, heat waves, cold snaps…area affected, duration, and intensity) it would give the conclusions of IPCC report much weight in the Public dicourse. I am doing research. Using the NOAA data I did compile numbers of billion dollar disasters from 19810 to current. The number is indeed going up but not at the rate of inflation. Inflation is rising faster than the disaster rate trend line. Does this mean extreme weather is getting less extreme or less damaging? I tried to link you to my skydrive excel sheet on this but that site is flagged as SPAM. What the heck does inflation have to do with weather events?? And are events that only do 3/4 billion dollar damage not extreme events? Sounds like Norman is proposing the U.S. dollar theory of climate, that should have “weight in the Public dicourse” [sic]. Maybe he shouldn’t be posting on April 1st. Does this mean extreme weather is getting less extreme or less damaging? No, it means government regulation (in the form of building codes) works. Has anyone seen this article from the _Atlantic_? Who might he be thinking of that has predicted a 20 degree C (or even 10) rise before the end of the century? I suppose that racism could be the beginning of opposition to evolution and I am mistaking the policy first vrs. anti-science first order there because the civil war and civil rights struggle are largely history. Opposition to evolution would then be a vestigial aspect of a policy defeat. Racist predilections –> opposition to evolution –> policy defeat (civil rights) –> more general opposition to science based on sour grapes (seen in flat earth/anti-geology positions) –> successful exploitation by tobacco companies (anti-medicine) –> reprise by oil companies (anti-climate science). Seems more complicated, but it does fix an anti-science attitude in bitterness which would help to explain why it can take root and grow in the more educated conservatives. An unacknowledged and shameful basis like racism makes educating an anti-science position out of a conservative something that a classroom might not be able to handle. You might need to start with a therapist. Wili, reading the article you link, I can’t tell if that is actually quoting Huber about the “fringe” or if it’s something the author got elsewhere and tacked onto the more familiar range that Huber described. You might ask the guy who wrote it: http://motherjones.com/authors/michael-mechanic — with luck he’s kept notes and remembers where he got it. … Similar to current and predicted future climate change, the greatest warming appears to have occurred in the high latitudes, as mean annual temperatures were more than 10°C higher than present (Salzmann et al. 2009). The Willis paper at annualreviews is paywalled and that phrase isn’t in the abstract so all I have is Google Scholar’s quote without any context — but not it says “high latitudes” and that’s consistent with polar amplification, so it wouldn’t be a worldwide average number from the paleo record. If you search for “Salzmann et al.” you’ll find newer work by Salzmann as well — so you could do some digging. Joe Romm has had lists of extreme case numbers for a while, I’m sure you can find those. I think the billion dollar events are inflation adjusted but you can look it up. Also, re your #135, it’s about trends and attribution really. Not needed to wait until everyone is suffering higher costs to see the relationship. The published work already supports the attribution with statistical significance. In other words, you can ignore it all you want, but that won’t change the trend or the attribution… though the attribution will continue to achieve higher confidence intervals as time passes and the physics and understanding of the impacts of short term natural variation are better understood… along with a slew of other factors. Re. your #128 You are ignoring a tremendous amount of relevant factors in your narrowly scoped assessment of what to consider. Ever heard of thermal limits on crop growth? It’s been in the news a bit, so I’m sure it gets discussed, but I haven’t heard much reaction from the climate extreme attribution point of view about the Francis paper, that hypothesizes that the unusual blocking patterns in the NH could be the result of Rossby wave motion, as a result of Arctic sea ice loss. I would consider this a rather significant finding, if true, considering the lows in sea ice expected over the next decade, as well as, of course, the continuing temperature trend in the NH. Thanks, but I would not put Chris Mooney in the same category. He does seem to be working his way through some issues, but if you go, as I did, from Republican War on Science to Storm World to the last two, there is a progression, as there is on what of his blog activity I’ve seen. Having satisfied himself (and many others, for which I am very thankful) as to the facts, it seems to me he is now trying to find a way to improve the situation. I do think he went through a phase of being persuaded by the “own goal” pushers, and that’s a particularly nasty one because those who question themselves are likely to get bitten. The recent brain stuff is very polarizing. On the whole, I prefer graphic information and humor as communication tools and prefer to think that most people are conflicted but basically mean well, though it’s easy to wonder these days. Andy Revkin’s science deficit is strange and I wish it were possible for some of you who know what you are talking about to help him with it, but I guess his preeminence in the field for so many years has become a liability to opening the mind in that area. His embrace of Pielke and anyone else he can find, most recently Wallace is sad and unhelpful. He does get a lot of help there from his fan club on DotEarth. I have an even more limited education, which makes me think it’s not about getting more training but something else. I’d best leave it at that for now. The excerpt from Willis and MacDonald 2011 refers to mid-pliocene. If an extensive quote is desired here, I could provide that. Or if we can arrange to ‘meet outside’, I can email the entire article. It is a good one, reviewing the migratory abilities of plants & animals. Temperature extremes are not really the focus – more like rates. Norman @129 I generally agree with part of your claim: weather extremes tend to be produced by known phenomena. (But watch out for the ones that represent new weather patterns for the area concerned!) However, this is far from allowing them all to be attributed to blocking. Of course, prolonged heat waves and cold spells result from blocking, but the tendency over time is for the mid latitude heat waves to get hotter, and the cold spells, less so. For example, the blocking weather pattern that produced the central U.S. heat wave last summer was very similar to the 1980 pattern, but hotter overall. North of the dry line (located last year mostly in KS, same as 1980) high temperatures set few if any records, but lows and dew points were both warmer than 1980, and in record territory, an AGW footprint. You are correct that known and unknown phenomena cause individual weather extremes, and each second, minute, day, and month affects the next. But isn’t that trivial? You’re also correct that times and areas of heatwaves are balanced by times and areas of cool weather, but since 2000, 47 countries have new record highs while 8 have new record lows. Reality seems to follow the OP’s contention. You might be correct that a narrowing of the thermal differentials between day and night and summer and winter could reduce some forms of extremes (I’m thinking extratropical cyclones), but it could just move them poleward. Then there’s the fewer, more powerful hurricanes hypothesis. But the topic is “Extremely Hot”, and it is pretty cut and dry. Move or warp the curve and the probabilities at the tails are affected more than in the middle. Sort of the polar amplification of statistics. What was the guy from Skeptical Science talking about? Long discussions about …. I am in agreement that AGW will increase the temp of heat waves when they take place. Omaha, Nebraska reported its hottest March since records begin. But it was only about 1.5 F above the previous record that took place in 1910. Perhaps the patterns were familiar in both cases. The AGW signal is the warmer overall temp. To get similar conditions in the area of Omaha, Nebraska (not just a point source, the warmth was extensive across the US) took 100 years from 1910. The point I am making is that nearly all of the extreme weather events are casused by blocking events or cut-off lows. I have not yet found the forces that create and sustain these blocking events. They are well known and observed. Do your sources have the explanation of what causes the blocking patterns and what determines their sustainabliltiy? My point is that you have 3 possibilites with AGW. More blocking patterns develop and last longer. In this case extreme events would definately increase in number, intesity and duration. You could have the same number. Then you will have heat waves with a little higher overall temps than previous as Omaha has experienced. If AGW causes fewer blocking patterns that are of shorter duration, then I would expect less extreme weather events in the future. The ones that do happen would be warmer than previous or wetter but there would be fewer overall and if they do not last as long, even the high temperatures may not exceed previous levels. This is the major point I am making in my posts. If you have the answers please share. Thanks. See also papers within this Masters post. See also this Francis post. He also mentions Nixon’s southern strategy which worked because Kennedy and LBJ passed civil rights legislation. Perhaps the way to talk the conservatives out of their position is to discuss how the Church of Ethiopia was one of the first established, and any implication in the theory of evolution that all men are brothers was established long before when St. Phillip baptized the Ethiopian. No need to hate evolution on that account.